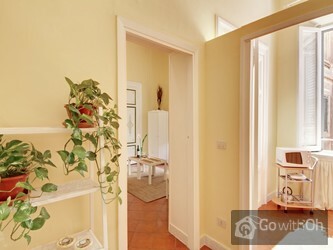 This 100m2 apartment is located in the historical centre of Rome and can comfortably sleep up to 6 people. It is situated on the third floor (with a lift) of a magnificent building with a concierge. 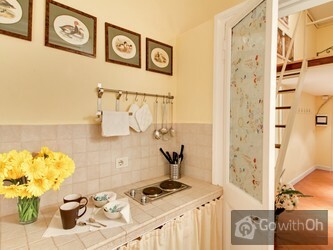 The apartment is very peaceful yet located in a lively street and has windows overlooking the rooftops of Rome. Just a short stroll from the accommodation is the famous Piazza Venezia, the Campidoglio and some of the most important avenues in the city  the Via dei Fori Imperiali, Via del Plebiscito and the Via del Corso. The building has access to the latter - one of the main thoroughfares for shopping in the Italian capital. The neighbourhood also has a wonderful selection of cultural, gastronomy and leisure attractions. As well as the famous Piazza di Spagna, the beautiful Fontana di Trevi and the impressive Pantheon (all just a walk from the apartment) there are many other interests to be found in the adjacent streets such as the important archaeological complex of the Mercati di Traiano and the Palazzo Valentini, the centre of the Roman Province. There are a number of bus lines that run directly to the Vatican and its museums, the Borgo Pio and the famous Castel Sant Angelo, all stops within walking distance from the accommodation. This elegant apartment includes a large and very comfortable lounge-dining room that is a perfect spot to enjoy meal times, as well as a leather double sofa bed, flat-screen 28 TV and very carefully thought decoration; a door separates this area from the rest of the apartment and thus offers an added touch of intimacy. The modern in-built kitchen offers a beautiful view over the Palazzo Doria-Pamphili, and is fully fitted with microwave and full utensils. The apartment has two bedrooms- one with sloping ceilings and two single beds and the other with a large double bed in wrought iron, a single bed and wardrobe with mirror. There is also a large 25m2 bathroom with views over the courtyard of the Palazzo Doria, decorated with black tiles, a shower and washing machine. The apartment has air conditioning and heating in all the rooms and internet WiFi conection. Check-in after hrs 21.00 have an extra charge of 40. Todo muy bien, de acuerdo a lo pactado. Nos resolvieron todo lo que solicitamos con amabilidad y eficiencia. El apartamento es perfecto para pasar unos días en Roma, es muy acogedor y Francesco y su esposa son muy atentos. Recomendaría sin duda el apartamento a mis amigos, si volvemos a Roma lo escogeríamos de nuevo. Perfect location, perfect apartment. What you see to the fotos on the internet is what you get!!! Die Lage ist hervorragend - wenige Fußminuten von der Piazza Venezia. 9/10 rien à redire. Exceptée une des chambres où l'on entendait bcp le bruit de la rue la nuit. Mais la qualité de l'appartement, la propreté et la situation excellentes (de même que le pharmacien situé juste en bas et où nous avons acheté des boules quiès) nous ont fait oublier ce désagrément. A refaire ! Pas d'isolation phonique fenêtre chambre. La nuit on se croit dans la rue et l'on ne peut pas dormir. Problème remontées d'odeurs nauséabondes dans la salle de bains provenant de la tuyauterie. Dommage pour le prix de la location. Point fort appartement : très bien situé et propre. faltaba aire acondicionado en el comedor y era agobiante debido a la epica que lo alquilamos (ola de calor).Por lo demas.y en otra epoca lo volveria a alquilar. Muy limpio. El departamento está ubicado en el centro histórico de Roma y permite conocer los sitios más importantes de la ciudad sin perder tiempo en desplazamientos. The place it is really great! Very convenient to take pubblic transportation, confortable and the proprietario very helpful. I do recomend this place for a family to stay in Rome. El lugar es realmente optimo, muy conveniente para tomar el transporte publico, confortable y el propietario muy ...cortez y de gran ayuda. Recomiendo este lugar para vacaciones familiares. La persona que nos recibio, F, realmente EXCELENTE, se preocupó por responder todas nuestras preguntas. El equipamiento del apartamento estaba bien solo sugiero un horno para poder cocinar alguna o calentar la pizza. El apartamento estaba muy limpio y fue todo excelente! There were many aspects of this apartment that made it ideal for our vacation. the cleanliness , the position ( was excellent ) the size, well equipped ,comfortable and the owner was most welcoming and helpful.We would recommend it. El departamento esta impecable, con todas las comodidades. Solicite por Mail una cuna ya que viajaba con un bebe. Y cuando arribamos al departamento ahí estaba. Excelente. Me hicieron sentir como en casa. 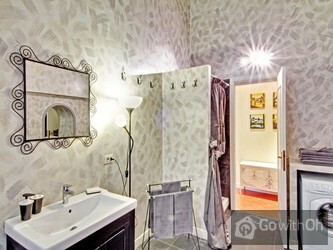 Beautiful apartment in fantastic location to explore Rome! We were met by F. who was very helpful and his tips made our trip even better! 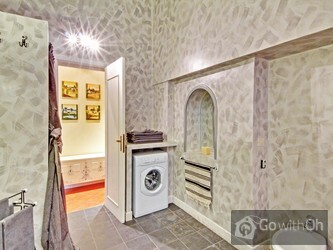 Great location, easy walking distance to all the main tourist sites. Very helpful and friendly owners. Apartment was clean and comfortable. We would happily stay here again. On arrival F. was waiting for us in the lobby of the building. He took us to the flat explaining in detail everything we needed to know from the front entrance, the lift, the neighbours, the appliances in the flat, everything. This was the most complete welcome that I have ever experienced anywhere.... 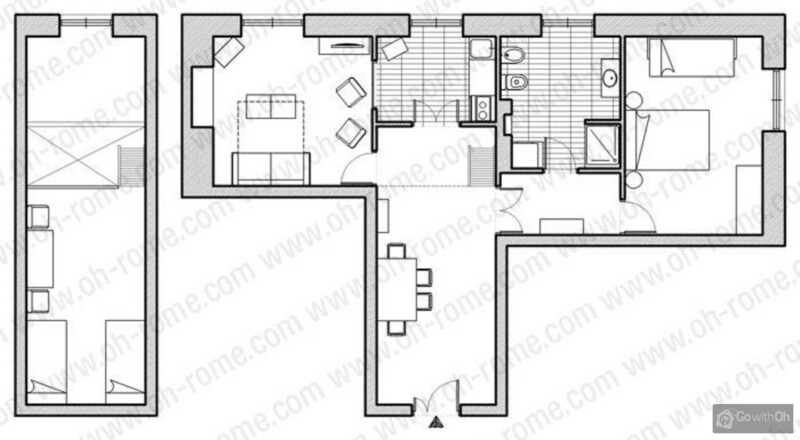 The flat is ideally situated in the first building off Piazza Venezia in Via del Corso. We could walk everywhere in Ancient Rome where we wanted to be. It was so central that we could easily walk back and forth for a shower , nap or refreshments. Although we slept on a sleeper couch in the lounge (we were seven people), this was much more comfortable than I had anticipated. The air conditioners were in perfect working condition, so we had no problem with the summer heat (July) or mosquitoes. I quickly learnt why the streets are so clean. Every morning, very early (I think perhaps from 05:00 or thereabouts), there is a team cleaning the rubbish bins and streets, with a lot of noise. So from the second day I made sure that the shutters outside, the windows and the shutters inside were all closed when we went to bed. Only exception was the bathroom. We kept the bathroom windows open and the door closed day and night, for an unpleasant smell wold quickly appear in the bathroom when the windows were closed. It is beatifully renovated and the appliances were all in perfect condition. F. is obviously proud of this unit and keeps it very neat. Great apartment for a family of five. Friendly and helpful owner. Excellent central location close to great restaurants and all the main attractions of Rome (although the central location also comes with some traffic noise late at night and early in the morning). Highly recommended. El único problema es que llovió bastante y se filtraba mucha agua por las ventanas. El alojamiento es estupendo, situado a 5 minutos de todo la más importante de roma. Acogedor y con todo lo necesario y el propietario fue muy amable. Volvería sin pensármelo dos veces. Lovely apartment exactly as shown in the pictures. Very clean and nice comfy beds. Location couldn't be better as it is right in the centre and check in with A was easy, friendly and efficient. Would recommend to anyone!! La estancia en Roma fue perfecta. Realmente recomendable. 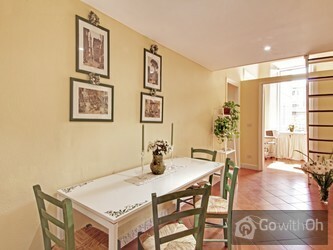 The apartment is in a fantastic location, 10 mins walk from the colosseum etc. The apartment is very clean and modern and has everything you need. 7 of us stayed comfortably, as long as you don't mind sharing a bed, as 2 beds are double and the rest single. I would definitely stay here again and ...would recommend to anyone. The owner was extremely helpful and thoroughly explained everything in English on arrival. Air con is in every room and the wifi was a bonus! F, el propietario fue muy amable ,serio y formal. El edificio es muy tranquilo y la ubicación excelente para desplazarte cómodamente por toda Roma, además de contar con algunos supermercados cerca . En el equipamiento destacamos el aire acondicionado ya que estuvimos en julio y hacia ...realmente calor.Lo recomendaría a todas mis amistades y no dudaría en repetir. Nice large & clean apartment, well equipped. Super location. Would book again. Great owner. El apartamento está situado en un lugar muy céntrico que permite acceder caminando a todos los monumentos.La limpieza impecable y la decoración muy bien.El único pero serían las ventanas que encajan mal por lo que entra bastante frío (aunque no se nota debido a la calefacción), con el ...consiguiente gasto energético y en el dormitorio principal, al lado de Via del Corso, continuamente transitada, es díficil el descanso debido al continuo ruido. 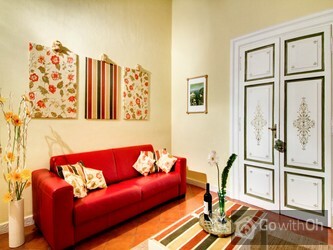 This was an exceptional apartment close to all Rome's attractions. It as on a busy street yet quiet and very private. 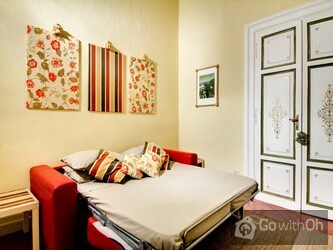 I would recommend this apartment to anyone wanting an easy stay in Rome. We enjoyed it very much. ). Como aspectos a mejorar se debería revisar la limpieza del menaje de cocina y se podrían incluir un par de pastillas para la lavadora así como una fregona en el equipamiento. Los propietarios son muy amables y cercanos. Como anécdota, indicar que pedimos una cuna para bebé y nos la facilitaron sin problema, pero sin sábanas, por lo que no la pudimos utilizar. 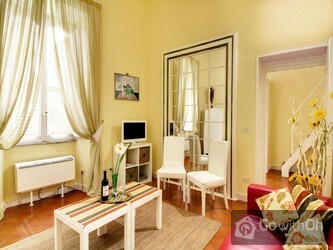 This is a very spacious and clean apartment in central Rome. We were able to walk to all the major sites. The only negative is the noise from the main road (via del Corso) and this did affect my sleep. However, it is a trade-off between noise and staying central. The only negative was also a positive - the location, perfectly central on Via del Corso, made the street noise a little bit loud with the windows open, but we slept like babies anyway and adored the apartment! 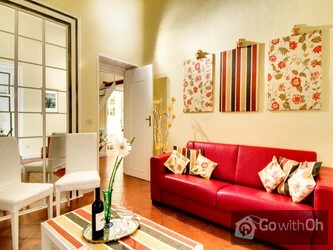 Charming, roomy, clean, totally Rome!! And with 4 adults, it was much more spacious and economical than a hotel. Would stay again in a minute. This apartment was more than we imagined. It was simply perfect for our short stay in Rome.The apartment itself was much larger than I envisioned and was clean and neat. The owner was fantastic. We were late arriving and he was most understanding. He took the time to explain the entire apartment... and also gave us great information on site-seeing in the city.The apartment is central to everything. A few minutes walk from all of the major attractions. We simply loved it. Thank you! Great location - right in the heart of things. Walking distance to everything we wanted to see. Nicely appointed apartment. A bit noisy, since it's right on a main street. Très bel accueil. L'apartement est très bien situé et malgré la rue passante qu'est Corso, nos nuits furent très agréables. Peu à redire à l'exception que quelques rouleaux de toilettes auraient été un léger plus (1 seul) mais cela semble être la norme dans les autres apartements ...réservés. Drôle à dire mais des couteaux aiguisés seraient vraiment un plus. Somme toute un séjour très agréable! Merci. El propietario estuvo atento a la hora de nuestra llegada y nos explico todo acerca del apartamento. Todo muy limpio y en condiciones optimas para que la estancia en roma haya sido perfecta. 100% recomendable. Die Wohnung entsprach ganz meinen Erwartungen und ihre zentrale Lage steigerte noch das Wohl- und Lebensgefühl. Sie ist genau richtig für einen entspannten Romaufenthalt. Ich kann sie nur weiterempfehlen. Für meinen nächsten Romaufenthalt werde ich sie ganz sicher wieder mieten. Die Wohnung ist geräumig und sehr ansprechend eingerichtet, man freut sich nach seinen Besichtigungstouren zurückzukehren. Ein Wermutstropfen ist der Straßenlärm der Via del Corso, den man auch nachts und bei geschlossenen Fenstern sehr deutlich hört. Ohrenstöpsel sind erforderlich.